A lot of exciting things happened at E3 that weren't big-budget sequels. Like yarn, robot dinosaurs, and a giant, awesome dog. The annual video game onslaught of E3 is finally over, and as expected, it served up plenty of big-budget sequels, like Halo 5, Fallout 4, Dishonored 2, Uncharted 4, and of course, the Final Fantasy VII remake that made everyone lose their collective minds. 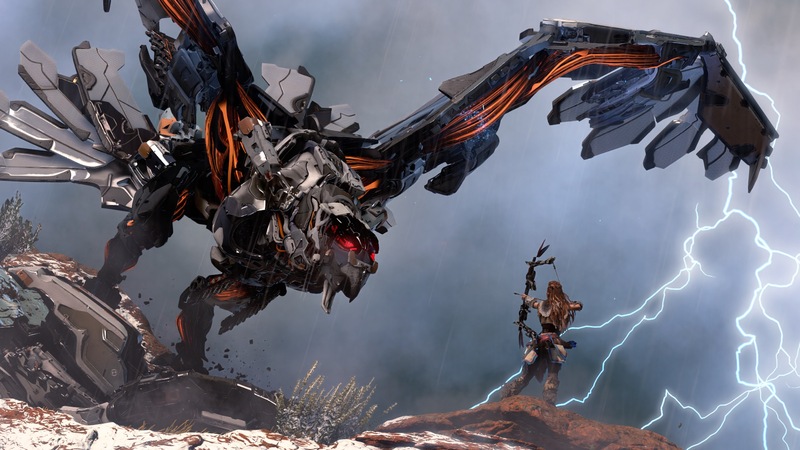 But a lot of other cool things happened at E3, like yarn, robot dinosaurs, and a giant, awesome dog, not to mention a comparatively remarkable number of titles with female protagonists. Join me now on a whirlwind tour of all the exciting new games that weren't popular franchise names followed by numbers! The moment I saw the beginning of The Last Guardian trailer I said aloud, "oh man, please let this entire game be about this giant dog." Great news: it is. People have been waiting for The Last Guardian since 2007, largely because it's the newest title from Fumito Ueda, the guy who made super beloved puzzle-ish action games like Ico and Shadow of Colossus. You play as a young boy who befriends a giant dog-bird and has to help guide him across a lot of precarious platforms, and if the trailer is any indication it will simultaneously trigger both your "oh god, don't kill the dog!" and "oh god, don't kill the kid!" anxieties near constantly. The surprise delight of E3 was surely Unravel, where you play as a tiny red yarn character named Yarny who soars, swing and climbs through charming landscapes, all the while warming your heart like a delicious Hot Pocket. His adventures will surely be a momentous entry in the yarn history of video games. The team that brought you Gone Home heads into orbit next year with their sophomore game. This time instead of exploring a mysteriously empty family home, you're exploring a mysteriously empty lunar transfer station named Tacoma, suspended in space 200,000 miles from Earth. I also hear that the latest newsletter from the Fullbright team about discusses the benefits of injecting astronauts with bear DNA, which earned it an immediate sign-up. If you've ever seen the Japanese game show Hole in the Wall, Superhypercube is like that, but in virtual reality and with blocks. The video game collective Kokoromi has been working on this puzzle game for a long time—so long, in fact, that virtual reality became plausible and they were able to abandon their red/blue 3D glasses effects for the immerse VR of the upcoming Project Morpheus headset. The developers say its aesthetics are inspired by 2001: A Space Odyssey, Blade Runner and Xanadu; they have my attention. Dystopian futures are a dime a dozen these days, but what about a dystopian future where you fight robot dinosaurs? In this post-apocalyptic world, humans have lost all of the technology we take for granted, and are hunting once again with bows and arrows. The people of yesteryear (read: us) are known as "the Old Ones," an advanced civilization lost to a mysterious darkness... and then overtaken by robot dinosaurs. Listen, it's not important why. It's important that robot dinosaurs. Watch the trailer, and see if you don't want to keep playing when it finishes. Bonus points to Sony for going the extra mile and using a female protagonist, even though it seemed risky to them. This is a game about building your dreams, "whether they’re games, art, films, music or anything in-between and beyond." According to the trailer, your dreams can include: the polar bears from those Coca-Cola commercials, hover bike battles, teddy bears who kill zombies, and polar bears who play piano. That's... most of what we know at this point. Despite the scant details, it's worth keeping an eye on if only because it's coming from Media Molecule, the developer that brought us the weird and wonderful Tearaway and Littlebigplanet. The idea behind No Man's Sky is hard to resist: a procedurally-generated universe, full of 18 quintillion possible planets, all for you to explore. You can descend to the surface of the the worlds you find, learn about their diverse flora and fauna, engage in space battles, and gather resources to trade for better ships. While the trailer above is the best first look at the game, the E3 presentation really drove home just how mind-blowingly large this game is going to be. The trailer for ReCore opens on a woman wandering through a desert and fighting with her mechanical dog pal. While that's a game I'd totally play, it's a little more complicated because spoiler alert: the dog dies. But also it doesn't; the energy core in the robodog remains intact, and when the woman inserts it into a humanoid robot body, it immediately comes to life, ready to fight alongside her again. We're told that our protagonist—one of the last humans on Earth—will "forge friendships with a courageous group of robot companions, each with unique abilities and powers," I'm guessing by transferring the core from body to body. The big name attached to this one is Keiji Inafune, best known for his work on another series that often featured a helpful robot dog: Mega Man. Continuing the pet theme, Beyond Eyes is about a 10-year-old girl named Rae who sets out to find her lost cat, Nani. The twist is that Rae is blind, and the game asks you to move through the world in a very unusual way, using memories, touch, sound and smell as your primary means of navigation. Big ups to Cuphead for daring to look like absolutely nothing else in games right now; partly inspired by both the work of legendary animator Max Fleischer (and a pre-WWII Japanese animated propaganda film), this run-and-gun game about a cupheaded man repaying a debt to the devil looks every bit like a cartoon ripped out of the 1930s. While this might be a debatable entry on this list, I don't think you can really count Fallout Shelter as a sequel; that would be Fallout 4, which also got announced at E3. Rather than the roleplaying action games we're accustomed to from the Fallout franchise, however, Fallout Shelter is a mobile game where you manage the lives of all the little people crammed into an underground vault after the apocalypse. It is available for download right now and also sort of hilarious, although if you're the sort of person who used to feel bad killing Sims, some guilt may be unavoidable. Android users can expect their own version of the game in a couple of months. Edit: I forgot Firewatch, an omission so unfortunate that I had to come back and add it in. This first-person mystery game is set during 1989 in the isolated wilderness of Wyoming, and you're a volunteer fire lookout whose job is to make sure the woods don't go up in smoke. Your lifeline to the rest of the world is a woman on the other end of a walkie-talkie, a connection that grows more and more important when several women go missing, the communication lines get cut, and everything starts to get very, very weird. If the taste you get from the trailer makes you want more, you can see 17 minutes of gameplay here.